No time to pick your own ferns? 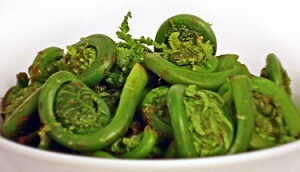 Then try the Wild Fiddleheads from Earthy Delights. Check out this mouth watering recipe from Seasaltwithfood. Edamame (Shelled Green Soybeans), Feta Cheese and Fiddleheads mixed with olive oil, lemon juice, seas salt and black pepper. Simple ingredients that make a visually serene green impact. Pick up your salad fork and try a tasty frond. 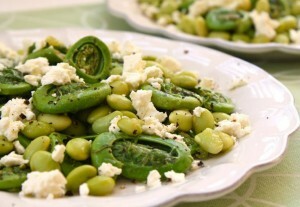 This fiddlehead salad would definitely add unique pizzaz to your Spring rehearsal or wedding feast! In a bowl, whisk together lemon juice, olive oil, sea salt and pepper. Set aside. Bring about 6 cups of water with 1 tsp of salt. Add the soybeans, cook for about 10 minutes,then mix in the Fiddlehead ferns. Continue to cook for about 2 to 3 minutes. rinse with cold running water. Drain well. Pour the lemon juice over the vegetables and toss to coat. To serve, top the salad with some feta cheese, some freshly ground black pepper and sprinkle with some sea salt. This was written by admin. Posted on Saturday, May 30, 2009, at 1:24 pm. Filed under Reception. Tagged Ferns, Recipes. Bookmark the permalink. Follow comments here with the RSS feed. Post a comment or leave a trackback.